Home Dennis Montero Ethan Smith Fhrancis Lopez lifestyle male pageant Mark John Gutoman Mister Philippines 2014 Onakee dela Cruz Raphael Carlos Vince Del Mundo Willan Pagayon Who Is This Year's Mr. Philippines? Who Is This Year's Mr. Philippines? Mister Philippines is a male personality competition that showcases the intelligence, self-esteem and principles of the modern Filipino as the role model of the youth – patriotic, educated and fit. So, who will be this year's winner of Mister Philippines? 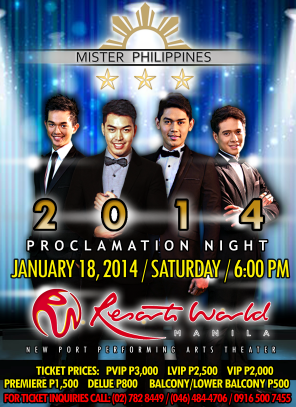 The big reveal happens tomorrow, January 18, 7pm at Resorts World Manila Newport Performing Arts Theatre.